5 cars for the 1700 to Bristol! Glad I'm only going Reading to Didcot. Glad I managed to get the 1630, nice 9 coach service. Over a dozen short formed IETs again today. This is the "new normal" and therefore not very newsworthy. What is arguably of greater significance is that 4 services to or from Cardiff are cancelled due to no staff. Had these 4 services run, then presumably another 8 IETs would have been short formed taking the total to over 20. 20 short formations have occurred previously but would be worse than normal. 20 short formations now, so had the 4 cancelled services run it would presumably have been 28, which is worse than the new normal. 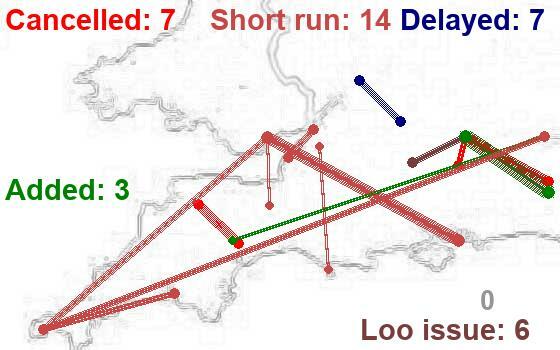 I notice that the majority of short-formed IETs today are due to train faults, as opposed to lack of GWR staff. We're told that several units are undergoing modifications, including to the PIS/Reservation system, and are therefore the reason for the short forms which will be a temporary measure until all units are modified and accepted back into service. For once I share Broadgage's scepticism about such claims! I am currently sat on a 9 car IET with no hot water, no reservations and the trolley is no where near me, even at Swindon! So all going well then. Not bad by IET standards. Reservations and hot water remain future aspirations. The trolley MIGHT appear, but don't count on it. I think that two trolleys may be a future plan. More of a software update than physical modifications including an update to the SDO database. On the 17.26 from Cardiff to London reservation for coach h, managed to bag a hard seat in A. It's short formed. Looking forward to seeing the trolley. ? 17-26 short formed ? I do not see it on journey check. I smell a rat. Guard apologies said the it should have been a nine carriage set. No reservation showing still some seats left after Swindon. Trolley been past 4 times it turned around 2. Noticing a nice little rattle from the one of the glass shelves when we go a little bit fast. I wonder how long before other's go this way. Oh and the air conditioning is working very well to the extent I am cold. I know I should move. 2x5 on the first run into Cornwall today. 05:53 Plymouth to London Paddington due 09:00 will be starting late from Plymouth.